Sometimes, even with the best intentions, we can start developing an idea only to realise later that it needs tweaking and that is how, three years since its birth, eco-luxury brand Bodhi became Bodhi & Birch, drawing inspiration from the balance of nature and its botanical healing remedies. Elijah Choo, the brand’s founder, is not the type of man who rests on his laurels, ever. In addition to running Bodhi & Birch, offering support to his colleagues and friends, creating new products, he also manages to launch a new online digital platform BodhiLuxe ( where yours truly is proud to be a contributor ), is slowly and painstakingly restoring his home, 16th century Bittell Farm ( where he also has a garden which demands his tender loving care ). How Elijah manages to do it all in 24 hrs slots I don’t know but I can vouch that he doesn’t launch a product unless he made sure it’s as perfect as can be. 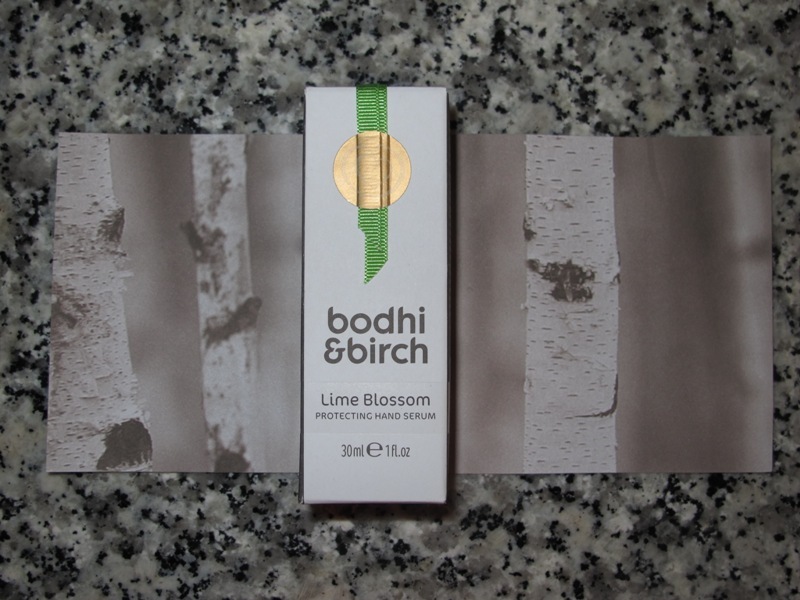 I have been very lucky to test Bodhi & Birch’s new launch a few months ago and in the middle of winter, when nights were cold and hands felt rough, this hand serum has been a welcome warming delight for my dry hands, as well as the senses, giving an uplifting boost to the whole body with its powerful aroma. Lime Blossom Protecting Hand Serum is oil- based and was created by Elijah, who uses his own hands in the lab, at home and in the garden, so he perfected it thinking about both men and women, and pushing forward with the idea for a hand product that will moisturise, soften and protect the hands. Lime Blossom Protecting Hand Serum is the first hand serum I have ever come across in the beauty market and it is one of the products in the eight piece collection of Bodhi & Birch Artisan Series, with each product hand-blended and created in small batches in order to ensure optimum performance from the pure botanical essences that can be both fragile and powerful. When the hand serum was developed, Olive Squalane, Rosehip Seed Oil, Lime & Green Mandarin became the focal ingredients. Why those ingredients I sense you asking? Well, Olive Squalane is an ingredient that seems to be grabbing the headlines this year. It is derived from olives ( and we all know how good olive oil is for one’s skin & health – I have a friend whose grandmother uses nothing but Italian cold pressed olive oil on her skin and even in her 80s she has beautiful plump & moisturised skin that a teenager can envy ) and contains a unique antioxidant that will protect your skin from free-radical damage ( one of the primary causes of ageing ) plus will replenish our own skin’s squalane ( it is naturally present in our skin but its content diminishes as we age ) and diminish blemishes, age spots and lines. Olive Squalane is combined with Rose Hip Oil which is rich in essential fatty acids and vitamins and fused together with moisturising Plum Kernel and Safflower Oils, along with Vitamin E that assists in skin rejuvenation. As our hands come in contact with everything and you can’t and shouldn’t be washing your hands all the time – a balance is needed in everything – one needs to consider the antibacterial element of the products you use on your hands so this serum not only has anti-bacterial properties, it is also antiseptic and antiviral due to the blend of Lime & Green Mandarin essential oils that will protect yours hands, keeping your skin feeling fresh and you feeling uplifted, due to the citrus blossom scent of the serum that lingers on your hands, making you unconsciously lift them closer to your face. Those of us who work on computers would definitely want this bottle on their desks as their practical beauty multi-tasker. I tend to apply this hand serum once or twice during the day, particularly when there is a lot of washing, cleaning or gardening evolved or even when my hands are feeling tired but in the evening you should apply the serum to your hands after you did all of your face and body cares. Wash all of previous products residue off your hands, leaving them slightly damp, apply a couple of pumps to the palms of your hand and massage them into your hands, fingers, cuticles and wrists. Stretch your fingers, gently pull them away and take deep, generous breaths as your do it. The serum, which does feel like a slightly thicker oil, sinks in almost immediately, leaving behind beautiful hands that will belong to a person who clearly cares how he or she looks. And who know what tomorrow’s handshake can lead to ?